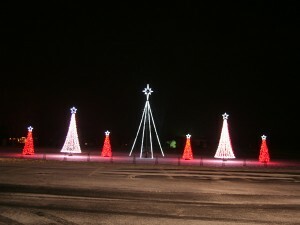 Posted on November 30, 2011 at 4:54:50 am by Kayleen R.
In Zanesville, Indiana (located just 20 minutes south of downtown Fort Wayne) the lights of the season call to the region, urging visitors to stop and reflect. Zanesville&apos;s Living Lights display features 50,000 LED lights arranged as leaping arches and shooting stars, synchronized to a myriad of pre-recorded holiday musical selections that takes place each Christmas season on the ball field outside of the Zanesville United Methodist Church. Bob VandenBoom, church supervisor of the display explains that, "We love to celebrate Jesus, the Light of the World, with this dynamic light display." Songs accompanying the Living Lights display, which lasts approximately 20 minutes, include tunes from the Tran-Siberian Orchestra and traditional and modern Christmas songs. New this year will be a contemporary arrangement of ‘Hark the Herald Angels Sing’ by Dave Shatto, a ZUM member and recent graduate of Belmont University. A special feature of the Living Lights show is the recorded reading of Bible verses from the members of the church’s youth groups. Light pole wreaths and lights in the trees and garden area complement the show’s effects. The Living Lights display is offered free to the public. A box is available for those who would like to make a donation to Tri-County Ministries, a local group that assists local families with groceries and household needs. Volunteers from the church’s Cocoa Corner offer free cookies and hot chocolate to visitors on Friday and Saturday nights. The Living Lights display begins the evening of Thanksgiving Day (November 24) and runs through New Years Day. Hours for the display are 5:30 pm-10:00 pm nightly. The church is located at 11811 N. Wayne Street in Zanesville. 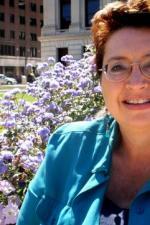 Call 260.638.4108 for more information or go to www.zumonline.org.